We all have seen some of our animals become ill, or more ill, or at least emotionally upset when we are upset. When our animals are ill, many of us, myself included, become irritable or anxious about their health and the nursing care needed. Then we may feel guilty about these negative feelings. I often need to remind you, my clients and students of great health, to think positively. You may think to yourself "Easy for her to say. My dog is so sick, how can I not be anxious." My cat is actually sick today - slightly lame leg and I notice I am irritable rather than worried. You also do NOT need to have a serious anger or irritability problem to benefit from this book. This is because We all get angry and irritated from time to time. 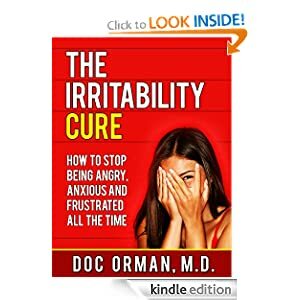 In this book, Mort reveals a powerful 5-step plan for getting rid of anger and irritability whenever these negative emotions occur for you. While becoming irritable is a tendency I have, Mort's oaching makes it easy for me to let go of this negative emotion in a few minutes - till it appears again! So go GRAB your free copy TODAY before this special promotion runs out. It's only available through Friday April 5, 2013. PHYSICIANS who have been somewhat trained along homœopathic lines manifest more confusion in the treatment of incurable diseases than in almost any other field of medicine. When faced with incurable cases, the thought occurs to a great many physicians to administer palliative measures in an effort to alleviate suffering and to attempt to hide from the patient and from the family the real seriousness of the situation. Although they may mean well, it is an effort expended in the wrong direction, and does more harm than can well be estimated. There is no place in the field of medicine where obliteration of symptoms will cause so much confusion, so there is no possibility of accurate prescribing, as in these incurable cases. The basis of cure is the fundamental law of similars. The law of similars is the fundamental law also in the palliation of incurable states. The administration of narcotics and sedatives suppresses symptoms and destroys the power of elimination by locking up the secretions in all states so completely that we cannot get a true picture of the condition of the vital force and energy upon which we must evaluate our symptomatology. The result of palliative treatment by the use of narcotics demands the continual increase of the drugging, for as soon as the effect seems to be subsiding, more drug must be administered. It becomes a vicious circle from which there is no escape except to be sent to the ultimate end in a confused and half-deadened condition, instead of being helped to live out as many years as possible in the easiest, quietest and most gentle manner. Many substances are used medically in such form, in such doses, by such methods and upon such principles as to be distinctly depressive or destructive of normal reactivity. They are forced upon or into the suffering organism empirically without regard to nature's laws. So far as their effect upon disease is concerned they are in no wise curative, but only palliative or suppressive and the ultimate result, if it be not death, is to leave the patient in a worse state than he was before. Existing disease symptoms are transformed into the symptoms of an artificial drug disease. The organism is overwhelmed by a more powerful enemy which invades its territory, takes violent possession and sets up its own kingdom. Such victories over disease are a hollow mockery from the standpoint of a true therapeutics. When we are facing these incurable conditions the administration of the similar remedy almost always ameliorates the situation, at least for three or four days, and usually for a longer period. Then we may have a return of the symptoms, when the indicated remedy will be called into use again. These conditions of impending fatality are usually accompanied by a great many symptoms, because the whole organism is involved and a gradual dissolution is taking place in every part of the economy and the vital energy is so nearly overcome as to be unable to throw off these manifestations. Sometimes one symptom or set of symptoms predominates and becomes the annoying, troublesome, disagreeable symptom-complex. In these conditions we must retake the case and reexamine the remedy that we have been using, to see if it corresponds with the disease condition. If the similarity exists in these especially troublesome manifestations, these patients can be made much more comfortable. For instance, a recent case of incurable cancer developed involuntary urination with absolutely no control over the condition. Her remedy was one of the Calcarea group. For this troublesome symptom of involuntary urination the repertory gives us five remedies of equally prominent rank which we may consider: Arsenicum, Natrum mur., Pulsatilla, Rhus tox, and Causticum. With the constitutional similarity of the patient to the Calcareas, Causticum was the only remedy to be considered, and one dose of Causticum 200 restored complete control over this disagreeable symptom, and made the patient more comfortable in general. Another class of symptoms that is very troublesome and which often falls under the use of palliatives, is composed of the patients who complain of insomnia. These patients will yield to the law of similars with pleasing results in their whole constitutional state, but not unless this symptom is considered with the concomitants that point to the remedy. Insomnia may be the outstanding irritating symptom in many varied symptom pictures. In some cases there is general coldness, and the patient will lie for hours awake unless he is covered with extra bed clothing, although he may not be aware of being uncomfortably cold. Worries of a business nature may be the cause of the accompanying symptom picture, or family disturbances may be at the bottom of the trouble. There may be pain and distress in certain parts. Any of these things attend a symptomatology of which the insomnia is but a part. Does he fall asleep if his knees are heavily covered? Is he kept awake by a rush of ideas? Is he lying awake because he fears that something will happen to him if he drops off to sleep? When does he lie awake-on first going to bed or after midnight? In other words, what are the concomitants? The insomnia may be treated with crude palliative measures so that the patient secures sleep, but at best this is an unnatural sleep; while if the insomnia is considered as a part of his symptomatic picture, and given its proper place in that symptomatology and the man himself is treated-not alone one or two symptoms-he will gain his natural, refreshing sleep and he himself will be improved in general health. Again, pain is one of the experiences from which human life has ever striven to free itself. Pain in itself is a blessing in disguise, for it brings to the patient a recognition of trouble, and to the physician the ability to recognize the location of the trouble. 1. Opium is a drug which stupefies the physician who gives it more than it does the patient who takes it. 2. A drug which greatly relieves the distress of the physician, who, without it, would be compelled to do something rational for the relief of the patient who has put confidence in him. Pain in itself is but a part of the symptom, however, for the physician must take into consideration the location: the kind of pain, whether steady or intermittent, and if intermittent, whether at regular intervals or upon motion, or is it dull, cutting, blunt or sharp, pressing, pulling, darting, cramping? Get at the type of pain as a characteristic symptom of the disordered condition; the times and circumstances of aggravation and amelioration, the reaction to thermic conditions, and all the concomitant symptoms that can be found. When the symptom of the pain itself is complete, with the location, type, and aggravations and ameliorations, your picture is almost complete; but if in addition you can find those concomitants (which may lie in the conditions of aggravation or amelioration but which are often from seemingly unrelated symptoms) you have a sound basis for the selection of a remedy which will relieve the pain promptly, and the patient will be much more comfortable and happy in general than with any narcotic. One of the most difficult problems a physician has to meet, where he has need of acumen and discernment and a complete knowledge of remedy pictures, are such conditions as manifest an alternation of symptom pictures in different seasons of the year, such as summer gastric disturbances and winter rheumatic conditions, the Dr. Jekyll and Mr. Hyde of chronic manifestations. There are a number of these conditions of alternations of symptom groups, and then there are the alternation of sides. When the patient presents himself to you, you may be justified in concluding from his story that his trouble is limited to the disturbed state of which he complains at that time; yet the remedy selected on this group of symptoms alone will often fail to bring relief, or, if the remedy does relieve the symptoms most marked at the time, the man's condition as a whole may not be improved, or indeed it may even be worse, since we have not cured but palliated a part of his symptom picture, obliterating a very valuable part of our symptomatology. If the patient is curable and we have thus obliterated a part of his symptom picture, we have blinded ourselves as to his true state: whereas a complete understanding of his condition over a period of several months would give a sound basis for a successful remedy selection. This is especially true in such conditions as gout, and we have remedies that have just this periodicity. Either for palliation of incurable diseases or for the cure of the curable diseases the symptomatology of the remedy must simulate, in so far as possible, the disease picture in order to bring relief, and where periodicity or alternation is a part of the symptomatology the remedy must have the characteristic feature if we are to expect it to be effective. It is sometimes true, when we have a case with alternating phases or series of symptom groups and we are unable to meet the condition with a remedy that covers all the phases (either because we do not learn of the alternating phases from the patient in the first place or because we do not know of a remedy to meet the condition), that by meeting the symptom groups as they arise in the case itself as we go on, the symptomatology becomes clearer and more distinct so that we more completely meet the conditions as they arise and the patient's condition becomes better as a whole. This is meeting the case by a zigzag process, removing the most pronounced and characteristic symptoms by the remedies most similar in each state, but it takes very careful prescribing or we are apt to hopelessly mix the case. This may be done in emergencies or when we cannot find a better method. It serves better as a palliative measure in incurable states than as a curative measure in curable states, and a failure in any of one of a series of successive prescriptions may mean the difference between possibility and impossibility of eventual cure. There is far more satisfaction and the case is much more complete if we can get a picture of the whole condition and of the single remedy to meet that condition. This may be difficult from two angles. The young physician may find it difficult to do this work carefully because he lacks the knowledge of the materia medica; but he has at his command a wonderful source of help in his repertories, which will often serve his purpose by quick reference, filling in the knowledge that he lacks of the remedy. Another possibility is that of remedy relationship and the relationship of the various inherited dyscrasias to the case; these are large subjects in themselves and will be discussed elsewhere. Again, it is very possible that the remedy covering the case has not been proved fully, or may not have been thought of by the students of materia medica. Here is where the limitations of man's knowledge manifests itself. The law is correct and God-given, but no secrets of knowledge are ever given without diligent work and observation on the part of man. Much work has been done by our antecedents in developing an exceedingly valuable materia medica, and they have left a glorious record in the symptomatology of the different remedies. They have given us the weapons to meet these states; if we fail it is not the fault of the law, nor of the weapons, but of our failure to learn the use of our equipment. Incurable cases are a source of great anxiety to every physician, but the physician who will follow the law of similars with the use of the single remedy in potentized form will give quicker relief and more sustained relief than all the massive doses of narcotics and sedatives. In cases of mechanical injuries where there is much pain and which would be subject to narcotic or sedative treatment under ordinary medicine, the homœopathic physician has a group of vulnerably remedies that will not only allay the pain and distress incident to traumatic conditions, but will prevent congestive, suppurative or gangrenous processes and actually will hasten healing; whereas narcotics, while deadening the pain, invite structural changes by slowing the natural recuperative powers. In this class we may mention such remedies as Arnica, Hypericum, Ledum, Natrum sulph., Rhus tox., and Ruta, each of the highest usefulness when indicated. These remedies cannot be used successfully at random, any more than in any other condition; but when they are similar to the condition they are of inestimable benefit. The homœopathic physician finds another substitute for narcotics in surgical cases, either before or after operation. Here the indicated remedy does excellent service, and the patient will go through the mental and physical distress very happily. These remedies will be indicated partly by the symptomatology of the patient and partly by the immediate causes of distress, such as lacerated wounds, strenuous vomiting, shock and incarcerated flatus. In other words, here also the symptoms must be complete. These are the things that may be done to relieve suffering. The same law applies in curable and incurable cases, and it is very essential in curable cases that no narcotic nor hypnotic nor sedative should be used, for the reason that these cloud the whole condition; but if the true reflection of the symptomatology be found we have a basis for help which no other means could offer. In incurable cases, or seemingly incurable cases, we must not put a limitation on the possibilities of the similar remedy, for in many seemingly incurable conditions the simillimum will so completely meet the situation as to obliterate the symptomatology of disease and the pathology, and will restore the patient to health. Might this cause suppression and begin a string of chronic disease?